Display pictures of family and friendly faces with the Better Homes &amp; Gardens 11-inch x 14-inch Wide Float Picture Frame, in black. This contemporary photo display features a .75&quot; black border that allows your photographs to shine. Hanging this 11-inch x 14-inch Float Frame in any room in your home or office to create a simplistic and clean look. 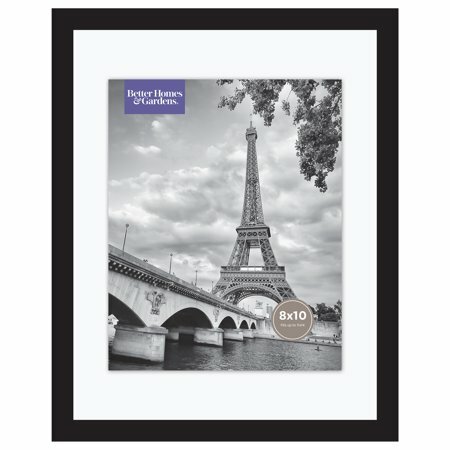 Each Better Homes &amp; Gardens 11-inch x 14-inch Wide Float Frame comes with a two metal wall hangers that allows you to hang this float frame vertically or horizontally working with your photo or print orientation. In addition to highlighting photographs, use this Better Homes &amp; Gardens 11-inch x 14-inch Wide Float Frame to display portraits or certificates and awards on your wall. The Better Homes &amp; Gardens float frame installs either horizontally or vertically with the provided hanger. Add other sizes to create a beautiful wall gallery on a living room wall, stairway or bedroom, displaying your favorite memories with family and friends. Display pictures of family and friendly faces with the Better Homes & Gardens 11-inch x 14-inch Wide Float Picture Frame, in black. This contemporary photo display features a .75" black border that allows your photographs to shine. Hanging this 11-inch x 14-inch Float Frame in any room in your home or office to create a simplistic and clean look. Each Better Homes & Gardens 11-inch x 14-inch Wide Float Frame comes with a two metal wall hangers that allows you to hang this float frame vertically or horizontally working with your photo or print orientation. In addition to highlighting photographs, use this Better Homes & Gardens 11-inch x 14-inch Wide Float Frame to display portraits or certificates and awards on your wall. The Better Homes & Gardens float frame installs either horizontally or vertically with the provided hanger. Add other sizes to create a beautiful wall gallery on a living room wall, stairway or bedroom, displaying your favorite memories with family and friends. These are awesome - much better than I expected for the price! I will be buying more. Love this frame! the Picture goes in-between two pieces of glass. Awesome design! Somehow I missed the one review on this item. I don't know who wrote this description but it is completely wrong. This is in NO WAY a frame for a poster. And it is not 24x36. It's 11x17 - there is no reference to 24x36 ANYWHERE!! This needs to be fixed. So frustrated. Made sure to order these in advance for an event and now they're useless. This is not a 24x36 poster frame. It's an 11 x 14 picture frame that holds an 8 x10 photo. Walmart advertised this as a 24x36 poster frame for $9.87. I ordered the frame and when it came it was 11x14. The advertisement is incorrect. I can't believe I didn't read the reviews. How can this be advertised as a 24x36 frame when it is not. Terrible.